J. Michael Migel & Leonard M. Wright, The Masters on the Nymph, New York, Nick Lyons Books, Doubleday & Company, 1979, p. 42. The case builders are the most conspicuous group. Many of the larvae build cases made from pebbles and sand or vegetative matter that are architectural marvels of perfect symmetry and beauty. Some larval cases, such as those from the Limnephilidae family, are made of both pebbles and vegetation. 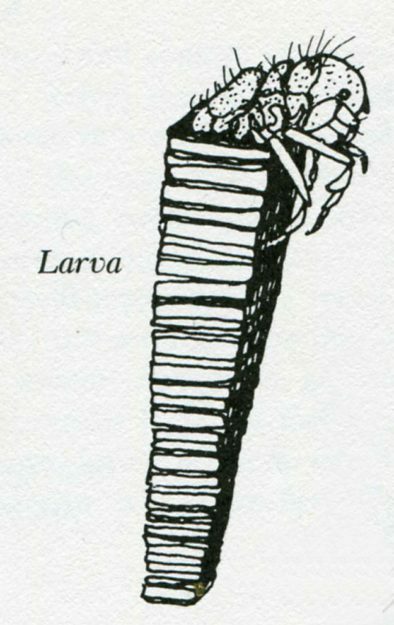 There are two basic type of case construction : saddle cases, where both ends of the larvae protrude, and portable cases, which are sealed at the back end. The Glossosomadae larvae are saddle-case builders. Some of the most important caddis species belong to this family. You can see thousands of their cases plastered to rockswhile you wade the riffles. The front and back openings are cemented in during pupation. 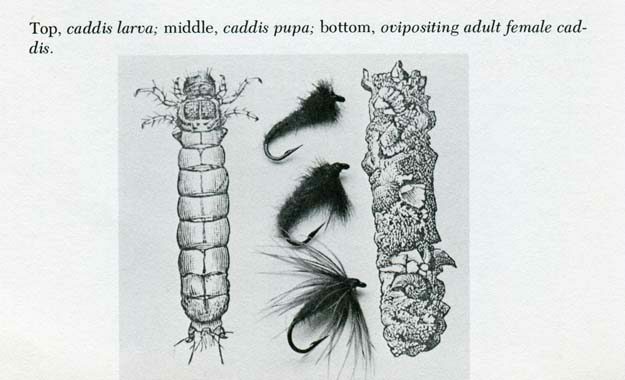 During lull periods, when mayflies aren ‘t emerging, trout may eat these cased larvae, but to get at them they must also eat the case. We’ve found that trout ressort to this only when feeding opportunities are exceedingly lean. Examples of swift-water portable cases be seen in the species of larvae that constitute the Bracgycentrus, Goeridae, and Odontoceridae familles. Limniphilidae larvae cases, such as those of the Limnephilus and Platyphylax genera, normally inhabit slower water such as the found in pools. Many eastern angler call them stick caddies. Their ragged cases are made from bark, leaves, sticks, and sand and may reach 2 inches in length. On June days in the Poconos and Catskills we have seen the entire bottoms of pools covered with these moving stick cases. Autopsies on trout during this period showed that trout seldom feed on these cased larvae, although they were unbelievably accessible. To sum up, trout seldom take cased larvae unless more vulnerable insect stages are not active ; thus case imitation are usually ineffective. 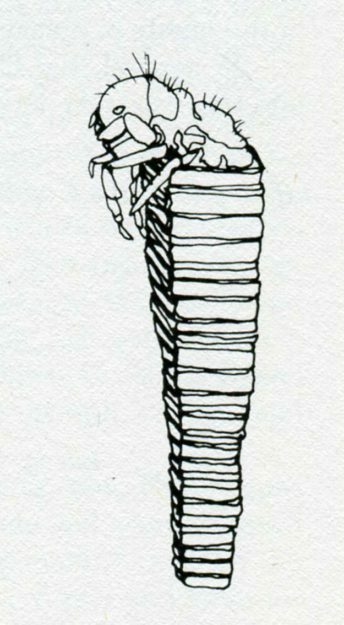 The pupa which seals itself in a case or in a cocoon, is normally just a inaccessible or unappealing to the trout as the cased larvae. Cette entrée a été publiée dans Appâts / Bait, Text / Texte, et marquée avec architecture, perfection, symmetry, le 1 janvier 1979 par Christian.